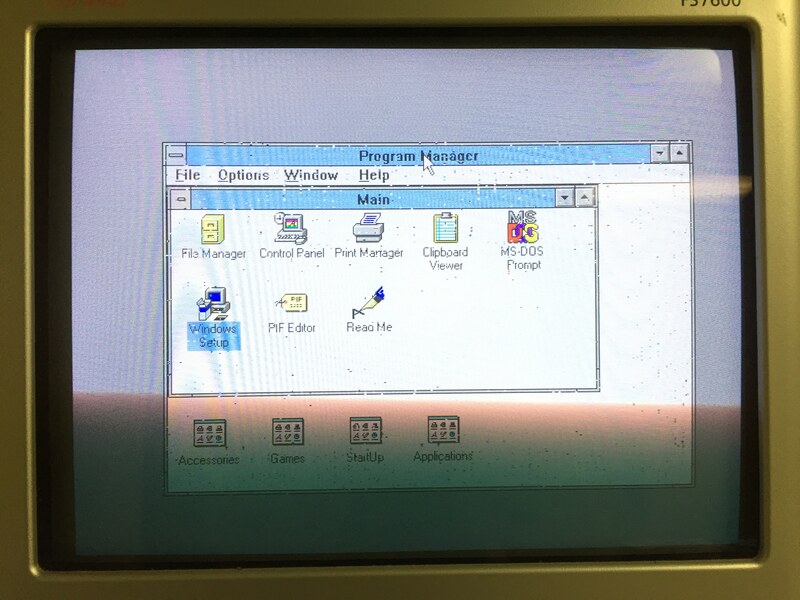 I picked up a nice Packard Bell Legend 245 over the weekend, and it works great apart from one issue so far: when dragging windows around the screen (Win 3.1), the screen gets corrupted with weird snow-like artifacting (see below). This only happens if I run Windows in 256-color mode. At 16 colors it seems totally fine. The corruption doesn't appear until you drag a window, save for the odd pixel that gets corrupted when rendering text, and it doesn't happen with every drag (but close to it). The snow remains static, and will travel along with the window if I drag it again, potentially worsening each time. According to MSD, the video BIOS is "LSI Logic Corp. BIOS Code, Version 10.05.03H". There's a single VRAM chip soldered to the board, labeled "NEC 424170-80L", and I can't find any information about it (such as size). I get the same results whether I pick the Super VGA 640x480 256 colors driver, or the Video 7 640x480 256 colors one. Does this indicate there's a problem with the VRAM? Or do I just need a different driver? I hit the turbo button to slow down the system (probably to around 8 MHz based on how horribly it runs), and the snow artifacts were totally resolved. I then adjusted the jumpers to underclock the CPU from 33 MHz down to 25 MHz. The artifacts were substantially reduced (probably by about 75%) but not gone completely. So whatever is going on, the CPU and main bus speed is definitely a factor. And I would assume the RAMDAC has to read the VRAM twice as fast in 256-color mode vs. 16-color mode. Well, turns it it was a driver issue, doing a really good impression of a hardware failure. I tried the suggestion of pushing on the chips to see if any pins were loose, but there was no visible effect. The thing that was throwing me off is that this is supposedly a Video 7 chip, but none of those drivers were actually working on this system. NOTE: Beware of all their shady decoy links that try to get you to download their driver manager/agent. The driver is in a 1.16 MB zip file. I'm guessing that this GPU uses an unusual framebuffer layout, and perhaps has to monopolize the VRAM bus a bit more than a typical VGA card to push 8bpp out to the monitor. That could explain the strange cloning of strips of the display, and VRAM read/addressing errors potentially caused by bus conflicts. So it was sort of a hardware problem, just thankfully not a failed hardware problem. Note that the HT216 appears to have been used in multiple Packard Bell models, so if you've got an old Legend with the same chip in it, this could well be what you need to install. it will switch to 800x600 256 color mode, but then the bottom ~25% of the screen is a clone of the top ~25% (in addition to the snow). This means that video chip reads wrong location of the RAM. I suspect you do not see it in 640*480 because that location is not used. However it is a good question how VRAM is organized, and requires datasheet for the VDP. What is the video processor installed? The snow remains static, and will travel along with the window if I drag it again, potentially worsening each time. Shot is good enough to see that colors are not arbitrary, but dots are kind "out of context" - they must be in some location of the screen, but they appear in wrong place. It means that VDP reads from wrong VRAM location, and, per my educated guess, when you drag windows driver uses hardware acceleration to move the screen area, which uses boosted clock (I am speculating here). As you say they are worsening each time it means not that VDP only reads data wrongly, it performs read-modify-write wrongly when running hardware acceleration. I would love if this issue can be solved by the replacing caps and marginal power problem. The first thing you must do is taking magnifier and look at the chip pins looking for cold joints or any defects related to conducting or non-conduct. In addition you can perform simple test - if you can run PC in disassembled shape try slightly pressing on chips - VRAM and VDP (probably other interface chips) dragging windows to see if action affects quality of operation. Actually issue in 800*600 mode shows either broken component (issue in its logic of operation), or bad contact (or other way around - good contact when it should not be there - e.g. shortage of address lines to power supply rail through some resistance). But at the end it may happen that problem is wrong driver :) or its settings. Dig into driver settings, control panel (or how it was called in Win 3.11), and of course BIOS. Not the answer you're looking for? Browse other questions tagged hardware windows31 vga or ask your own question. When did Great Valley Products, stop producing hardware? Which home-retrocomputers had a 1 single-color( no shades ) monochrome mode, or were by default?